Spirometry - method of measurement of lung capacity and its constituent volumes of air. Method spirometry was proposed and developed by Hutchinson in 1846 1-1 m was offered a device that measures lung capacity - spirometer of Hutchinson (Fig. ), which consists of two graduated cylinder capacity 6-8 L. Outer cylinder filled with water. It is placed tilted upside down inner cylinder, whose weight is balanced by special devices. In the cavity of the cylinder strengthened metal tube, inner end of which is above the water level, and the outer rubber tube with a glass tip. To determine lung capacity test subject makes pre maximum breath, closes the nose and through the tip of the tube slowly makes maximum exhale. 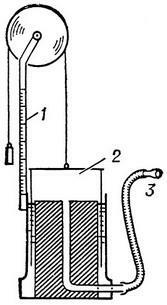 The volume of exhaled air, lifting the inner cylinder, measured on a scale, placed on the side. The air from the spirometer is available when opening the tube on the end of the rubber hose, through which you are exhaling. Usually the vital capacity is measured several times and record the average. Spirometry is widely used for examination of healthy people and in the clinic, primarily in various diseases of the cardiovascular and respiratory systems of the body.